Helping you "Get the Ugly Out" of your home and workplace. 1. 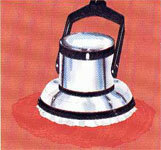 Rotary Method Here shampoo is scrubbed onto the surface of the carpet using one large or two small brushes. This does a fair job of cleaning the carpet surface, but the deep-down dirt is either untouched or carried deeper into the pile by the shampoo. And this method makes no provision for removal of the shampoo and dirt. The carpet must be vacuumed later in a separate operation. 2. Steam Method In the first place, no steam is used – probably a good thing since live steam would be disastrous to your good carpet. Actually, the “steam” is only hot water that is sprayed into the carpet. 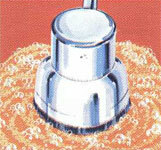 And in most cases, little more than half of the dirt bearing water is extracted from the carpet. The remainder is left and can result in soggy carpet, browning mildew, shrinkage, or damaged backing, padding and floors. Drying time can run up to 24-hours – a long time for any carpet area to be unusable. 3. Rotary/Bonnet Method Such procedures will brighten the surface but can’t remove the dirt deep in the pile. Results: embedded dirt works up quickly to the surface to resoil the carpet. 4. Von Schrader Low Moisture Air Cell Soil Extraction Method Von Schrader Low-Moisture Dry Foam Extraction System which is an exclusive, patented process. The LMX System is one of the most technologically advanced systems ever built for fast cleaning, quick drying and DEEP down cleaning of carpet.. Hot water extraction detergents leave a gummy, sticky, or waxy residue. This residue clings to the carpet fibers and quickly attracts soil. Rapid resoiling leads to a dull, dirty carpet appearance. Von Schrader’s specially formulated cleaning products leave a minimal amount of crisp, brittle residue that does not attract soil to the carpet fiber. 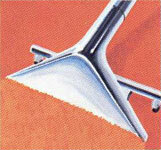 This prevents resoiling and preserves carpet beauty. The loose, non-clinging flakes are easily vacuumed away. 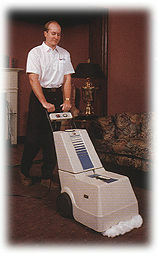 The LMX continues the evolution of a carpet-cleaning phenomenon that has yet to be equaled! Ecosuds is Hamilton, Burlington, and Grimsby’s Authorized Von Schrader Carpet and Upholstery Cleaning company.